Elizabeth Fox-Genovese was one of those rare people whose smile was always genuine and whose frowns could penetrate your heart. Betsey joined the Emory community in 1986 as Professor of History and Director of Women’s Studies. Two years later she was appointed as the Eléonore Raoul Professor of Humanities, an honor she held throughout the rest of her life. Known as a passionate mentor to both graduate and undergraduates alike, she was a tough critic and a compassionate advocate. As Chair of the Department of History, I have had to contemplate how we might build upon her legacy. This task has proven beyond me, for her scholarly accomplishment was so amazingly broad and deep. Here is a short roll-call, by the end of which, you will begin to understand why “replacement” is an inappropriate term, most simply put, inconceivable: 8 books on which her name appears alone, 4 jointly authored, often with Gene [Eugene Genovese], the third volume of one of these will soon appear, and 4 more books under contract at the time of her death. She somehow also found the time and energy to edit 6 volumes, and just since 2000 authored 24 articles or book chapters, while during that same period she gave 26 invited lectures. She and Gene, that ever-changing, ever constant dynamic duo, were the founding inspiration behind the Historical Society, the journal for which Betsey served as editor from its first number in 1999 up to her death. Grants and fellowships came to her from such prestigious institutions as the Fulbright Foundation, the American Bar Association, the Rockefeller Foundation, and, of course, the National Endowment for the Humanities, where she later served as a member of the Governing Council. 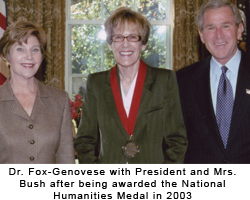 Our nation honored her and through her, Emory University in 2003, when President George W. Bush presented Betsey with the National Humanities Medal at the White House. Clearly Betsey Fox-Genovese had a career the likes of which few historians can even dream, yet her smile remained as welcoming as ever and her enthusiasm for helping her colleagues and students never flagged. The roll call above -- not yet up yonder -- has probably left you nodding in agreement over the impossibility of filling such shoes as hers, but the numbers of her publications and their sheer weight actually are not what I find so daunting. No, the real problem is the range of her scholarship and the depth of her passion for intellectual inquiry. Her first book took on 18th century France, later others explored the histories and the searches for identities first among women of the south and ultimately of women throughout our nation. Most recently appeared the masterful, Mind of the Master Class, in three volumes with Gene, exploring the roots and evolution of the way Southern slaveholders viewed their world, their inherent educational values, their religious and historical traditions. 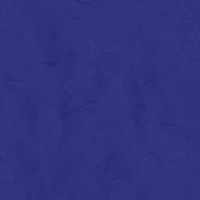 So what field of study might we say was her specialty – the history of the human condition? Into all areas, Betsey poured an incomparable passion, a penetrating mind and intellectual clarity. Entering into a discussion with Betsey was an education in itself, no matter the subject at hand. Everybody engaged, instinctively -- or perhaps it was reflexively -- tightened their arguments and took a deep breath. Our community of scholars does not accord such respect to many, in fact to but a handful. Taking up our bit parts from her award-winning role of compelling debate and intellectual rigor is truly our greatest challenge. We can only hope not to fail, for Betsey would be disappointed in us and she would frown, and then she would smile and chuckle. And so would we.